I've confessed this before, but I never watched a lot of movies growing up. My college years and beyond were when I dove in head-first, catching up with the hundreds (thousands?) of great films that I'd missed when I was too young to understand them. But Star Trek was different. The original series movies were always in fairly heavy rotation around my house during the mid-1980s and beyond...and given that the alternative was often Disney fare or other typical family entertainment, I was more than eager to explore this uncharted territory. Though I generally ignored the franchise for years after The Next Generation ended, those first six movies were an exception to the rule: I've seen the good ones more often than I can count, and Star Trek II: The Wrath of Khan is the best of the bunch. 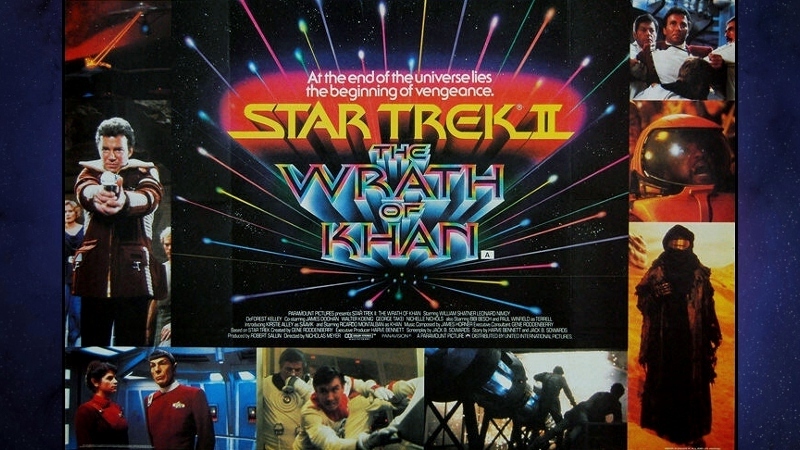 Responsible for resurrecting the franchise after its original three-season TV series and disappointing first film, The Wrath of Khan represented a huge shift in the ever-growing Trek universe; one that pulled a long-forgotten villain out of the grave, introduced several new faces, and had the audacity to kill off one of the series' most beloved characters (not for long, of course). It's perhaps the closest Star Trek has even been to perfect on the big screen: some may prefer the lighter tone of The Voyage Home or the condensed chaos of The Undiscovered County---both are great in their own right, and round out the top three original Trek films in most circles---but The Wrath of Khan equals or exceeds the original series' best episodes with a terrific pace, "new blood", and a truly threatening adversary. It ushered in enough change to shake things up, attract new fans, satisfy old ones, and cement the franchise's fading popularity for another fifteen years or so...all on a shoestring budget 75% smaller than the bloated first film. That "new blood" came in the form of several major contributors either largely unfamiliar with or completely new to the Star Trek universe, including director Nicholas Meyer (who eventually returned to co-write The Voyage Home and direct The Undiscovered County), screenwriter Jack Sowards (who also penned the script for a TNG episode six years later), writer/producer Harve Bennett (who famously binge-watched the series after having never seen it, eventually pitching the return of Khan), up-and-coming composer James Horner, and even the team at Industrial Light & Magic (their first of nine Star Trek film contributions, including the upcoming Beyond). Another newcomer to the franchise! They're so cute! Not surprisingly, this new blood is, for the most part, exactly what makes The Wrath of Khan so good...especially since the dramatically slashed budget forced its creative team to invent clever solutions instead of throw more money around. 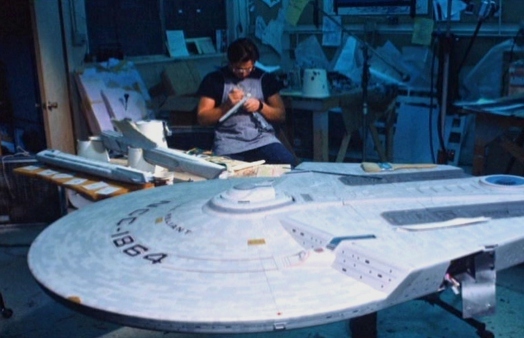 From re-tooled sets to thrifty but serviceable VFX (including the landmark "Genesis Effect", film history's first fully-textured CGI sequence and one completed by the team who would eventually form Pixar), there's enough spark and energy here to run laps around both Star Trek: The Motion Picture and The Final Frontier. Yet the reintroduction of earlier elements is important too: genetically engineered super-soldier Khan Noonien Singh (first introduced and last seen in the fantastic original series episode "Space Seed", again played by Ricardo Montalban and his real pecs) is the perfect foil for our crew, who weren't all keen on returning but were eventually talked into it. The theatrical cut of The Wrath of Khan was, and still is, a near-perfect slice of science fiction with enough stamina to endure dozens of repeat viewings. Aside from a few haircuts and primitive computer displays, it certainly doesn't feel like a film fast approaching the 35-year mark. An extended version was first seen during the film's network broadcast debut in 1985, but younger fans are likely much more familiar with the slightly different "Director's Cut" that debuted on Paramount's 2002 Special Edition DVD. This handy text comparison details the differences between the theatrical and director's cuts; as far as I know, the broadcast version has yet to be released in any official capacity. Unlike the 2009 Blu-ray boxed set (which included The Wrath of Khan, along with the other five original films), this new Blu-ray is sourced from a fresh 4K scan, along with an exclusive new featurette. plenty of older extras, and the long-overdue option to watch either version via seamless branching. Two small changes to the film can be spotted on this disc, however: one brief editing error occurs during the "Kobayashi Maru" sequence in both versions, and Nicholas Meyer requested a that brief dialogue exchange between Kirk and Spock ("That boy is my son") be removed from the director's cut. As for the first issue, a free replacement can be requested by e-mailing [email protected] or calling 844-898-4365; I've already requested and received my new disc, which does indeed correct the error. Seriously, take a deep breath. There's a lot---and I mean a lot---to like about this new 1080p transfer of The Wrath of Khan, as its new 4K-sourced restoration rights many of the wrongs made by Paramount's 2009 Blu-ray (which, to be perfectly honest, wasn't nearly as bad as some fans made it out to be). Image detail, film grain, textures, and overall depth improvements range from cursory to substantial, with the most consistent improvements being the film's color timing. Though not quite as warm as The Wrath of Khan's HDTV broadcast, there's a much more even-handed temperature in direct comparison to the blue-leaning 2009 Blu-ray...but depending on when you first saw the film, whatever constitutes "accurate color" may just be a matter of opinion. Perhaps this Blu-ray's trump card is that the transfer was supervised by director Nicholas Meyer; that's not quite as bulletproof as, say, one supervised by the cinematographer...but it's still a sign that The Wrath of Khan's look was a top priority, and the extra spit and polish is very much appreciated. DISCLAIMER: The screens caps and stills on this page are strictly decorative and do not represent Blu-Ray's native 1080p resolution. Originally created for the 2009 Blu-ray, we're again treated to a fairly solid Dolby TrueHD 7.1 mix that pushes the film's limited source material to its limits. This is by no means a room-shaking experience full of bombast and surround activity that amplifies the film's action sequences or terrific music score, but there's some modest depth on display here...as well as a few subtle (and not-so-subtle) tricks that sound fairly natural within its somewhat narrow sound stage. Bottom line: the dialogue is perfectly clear, the sound effects and music are mixed well and rarely fight for attention, and The Wrath of Khan will likely never sound better on home video. Optional French and Spanish dubs are included during the film, as well as English, SDH, French, Spanish, and Portuguese subtitles. The stylish, atmospheric interface is organized well and easy to navigate, with a handful of pre-menu distractions to deal with beforehand. This one-disc release is housed in an eco-friendly keepcase with eye-catching artwork that, in my opinion, looks much more suitable as a poster design than a Blu-ray cover (points for something different, though). Surprisingly, no digital copy has been tucked inside...or any inserts at all, for that matter. Plenty to dig through here. One extra is brand new to this disc: "The Genesis Effect - Engineering The Wrath of Khan" (28:12), a retrospective featurette that covers the film's unique production, ultimate success, and lasting legacy as perhaps the best Trek film to date. Featured participants include director Nicholas Meyer, screenwriter Mark A. Altman, producer Robert S. Sallin, producer Ralph Winter, Trek super fans (and saviors of the original series) John & Bjo Trimble, filmmaker Adam Nimoy, Gene Roddenberry's personal executive Susan Sackett, producer Scott Mantz, writer David A. Goodman, NASA systems engineer Babak Ferdowski, producer Michael Sussman, and more. Though it doesn't necessarily break much new ground (and, in some cases, repeats a fair amount of information from earlier audio commentaries), "The Genesis Effect" is still a welcome new supplement that fans should enjoy. Though it's not technically "new", one older supplement from Paramount's Special Edition DVD has been resurrected after its unfortunate absence from the 2009 Blu-ray: an enjoyable feature-length Text Commentary from long-time Trek contributors Michael & Denise Okuda. As expected, it's a dense and personal track with no shortage of interesting behind-the-scenes tidbits and makes a good "casual commentary" as it doesn't interrupt the main audio. For more rare behind-the-scenes photos from the entire Star Trek franchise, visit Forgotten Trek. Otherwise, everything else remains identical to the 2009 Blu-ray. Recycled from that release and earlier editions are two Audio Commentaries: the first features director Nichols Meyer (playable during either version of the film) and one with Meyer and long-time Trek producer Manny Coto (theatrical version only). Other returning material includes the helpful Library Computer interface (theatrical version only), a handful of Production Featurettes (cast interviews, music, special effects, etc. ), additional featurettes about The Star Trek Universe, a Ricardo Montalban Tribute by Nicholas Meyer, a collection of Storyboards, and the film's Theatrical Trailer. These extras are presented in a mixture of HD and SD, and all spoken-word content (except for the trailer) includes optional English subtitles. 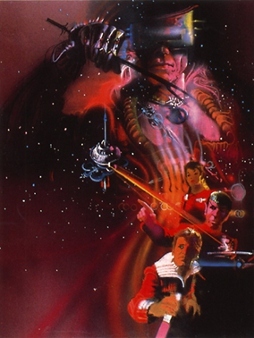 Most long-time Trek fans place Nicholas Meyer's game-changing The Wrath of Khan at or near the top of the franchise's most durable efforts, and I'm no different: this is near-flawless sci-fi, endlessly entertaining, and full of terrific performances and memorable moments. The bloated vagueness of Star Trek: The Motion Picture was traded in for streamlined action, thrifty (but serviceable) special effects courtesy of ILM, terrific pacing, plenty of twists and huge moments, and a pitch-perfect score by up-and-coming young composer James Horner. The Wrath of Khan holds up extremely well almost 35 years after its theatrical debut, and Paramount's new "Director's Cut" Blu-ray offers the best home video package to date: two versions of the film, a fantastic new 4K-sourced transfer, and no shortage of old and resurrected bonus features (and a new one, too). It's a no-brainer for franchise disciples, and a fairly solid entry point for potential new fans of the original Enterprise crew. Very, very Highly Recommended.